LANSING, Mich. — Sen. Dale Zorn, R-Ida, and his wife Cindy (left) joined Lenawee Community Mental Health Authority Chief Operating Officer April Demers (right) and her daughter Cait Corie on Wednesday as Lt. Gov. 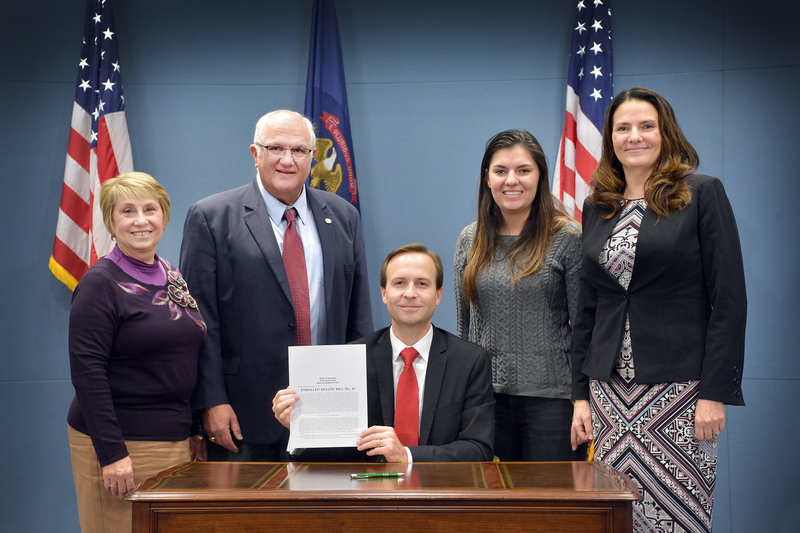 Brian Calley signed Zorn’s legislation to help combat the state’s growing opioid addiction epidemic. Senate Bill 47, now Public Act 252 of 2017, requires increased use by prescribers and dispensers of the Michigan Automated Prescription System (MAPS), a state-run program that tracks patients and prescribers for over-supply of Schedule 2 through Schedule 5 controlled substances. Zorn’s legislation is part of a bipartisan package of bills that are now PAs 246-255 of 2017. Editor’s note: The above photograph of Zorn is available by clicking on the image or by visiting the senator’s website at: www.SenatorDaleZorn.com/Photowire. LANSING, Mich. — Sen. Dale Zorn announced on Thursday that the Lenawee County Road Commission will receive a $375,000 grant from the Michigan Department of Transportation for work on Tecumseh-Clinton Highway. The Transportation Economic Development Fund Category F grant was awarded to the Lenawee County Road Commission to resurface 2.5 miles of Tecumseh-Clinton Highway in Clinton Township from the city of Tecumseh to the village of Clinton. The project includes drainage improvements, upgraded shoulders and pavement repairs. Tecumseh-Clinton Highway provides an all-season route between M-50 and US-12, and is an important north-south commercial corridor between the two communities. The repairs will extend the life of the roadway and maintain its all-season status. The $798,000 project will receive $375,000 from the state and $423,000 in matching funds from the road commission. The Lenawee County project received one of nine grants that will use $3.1 million in Category F funds for upgrading roads in urban areas to help keep Michigan open for business year-round. Category F grants are competitive grants intended to preserve and/or expand all-season road networks within the urban areas of rural counties. Eligible applicants for the grants are county, city and village road agencies within counties with populations of 400,000 or less. Frustration with the ever-increasing cost of health care is one of the most common things I hear about when meeting people throughout Monroe and Lenawee counties. As we do what we can to make health care and dental care as affordable as possible for Michigan families, it doesn’t make any sense to start taxing dental products that greatly improve the health of hundreds of people every year. My legislation to eliminate the sales and use taxes on dental bridges, crowns, dentures and other prosthetics is on its way to the governor’s desk to be signed. It will help control costs for residents who need dental prosthetics by clarifying that these products were never supposed to be taxed and helping ensure that they will not be taxed in the future. Senate Bills 566 and 567 and House Bills 5164 and 5173 would restore the sales and use tax exemptions for dental prosthetics. The savings is estimated to be roughly $10 million per year. Citing language in the 2004 rewrite, the Department of Treasury recently decided that dental prosthetics are not exempt and made an administrative decision to start charging sales tax on the products beginning July 1. These dental products were exempt from Michigan’s sales tax for more than three decades, until the state Department of Treasury arbitrarily started applying the tax to dental prosthetics. I thank my colleagues for supporting my bills to restore this exemption. I look forward to seeing the governor sign the measures and help curb unnecessary cost hikes for dental care. I applaud the Michigan Natural Resources Trust Fund (NRTF) board for including the Kiwanis Trail project in Lenawee County in its list of development recommendations for 2018. The expansion of the Kiwanis Trail would provide a wonderful opportunity for outdoor enthusiasts to spend time biking, running or even cross-country skiing with their families on over 10 miles of trail between the two largest cities in Lenawee County. The NRTF was created four decades ago to invest constitutionally restricted resources into improving the public’s access to outstanding recreational opportunities in our state, and that is exactly what the Kiwanis Trail project will do. The plan approved by the NRTF board includes $300,000 toward the Kiwanis Trail project, which will connect Adrian and Tecumseh with 7.7 miles of paved, dedicated trail thus providing more than 10 contiguous miles of paved trail to area residents. The trail parallels the River Raisin and intersects at many points, providing a variety of recreation opportunities in addition to use of the trail by walkers, runners, bicyclists, in-line skaters and skateboarders, snow-shoe and cross-country ski enthusiasts. The NRTF board’s recommendations for projects in 2018 will now head to the Legislature for review as part of the budget process. I strongly support this project and look forward to approving these restricted funds next year to enhance the quality of life in Michigan for generations to come. The abuse of prescription and illegal opioids is the deadliest drug epidemic in American history, and we have seen the terrible impacts throughout the state and here in our local communities. We must address the supply of these medications if we are serious about ending an opioid addiction epidemic that kills thousands of Michigan residents every year and it is getting worse. My legislation to help combat the state’s growing opioid addiction epidemic is on its way to the governor to be signed. Senate Bill 47 would mandate more use by prescribers and dispensers of the Michigan Automated Prescription System (MAPS), a state-run program that tracks patients and prescribers for over-supply of Schedule 2 through Schedule 5 controlled substances. While we stop abusers from taking advantage of the system to get excessive amounts of dangerously addictive drugs, we must also ensure continued access to pain medications for patients who truly need them. It is critical that doctors have a quick and accurate prescription database to check a patient’s history. My bill will help doctors better recognize potential addiction and stop doctor shopping that leads to addiction. Opioid abuse is a complex problem. This is a common-sense, grassroots approach to a comprehensive solution to protect our communities, save lives and maintain access to necessary pain medications. Mark Cochran, who co-chaired the Medical Work Group as part of Monroe County’s Call to Action to Reduce Prescription Drug and Heroin Addiction, supported my bill. April Demers, chief operating officer of the Lenawee Community Mental Health Authority, also supported our efforts. LANSING, Mich. — Sen. Dale Zorn applauded the Michigan Natural Resources Trust Fund (NRTF) board for including the Kiwanis Trail project in Lenawee County in its list of development recommendations for 2018. The plan approved by the NRTF board includes $300,000 toward the Kiwanis Trail project, which will connect Adrian and Tecumseh with 7.7 miles of paved, dedicated trail thus providing more than 10 contiguous miles of paved trail to area residents. The trail parallels the River Raisin and intersects at many points, providing a variety of recreation opportunities in addition to use of the trail by walkers, runners, bicyclists, in-line skaters and skateboarders, snow-shoe and cross-country ski enthusiasts. “I strongly support this project and look forward to approving these restricted funds next year to enhance the quality of life in Michigan for generations to come,” said Zorn. LANSING, Mich. — Legislation sponsored by Sen. Dale Zorn to help combat the state’s growing opioid addiction epidemic is on its way to the governor to be signed. Senate Bill 47 would mandate more use by prescribers and dispensers of the Michigan Automated Prescription System (MAPS), a state-run program that tracks patients and prescribers for over-supply of Schedule 2 through Schedule 5 controlled substances. Earlier this year, the state announced that it will fund a full integration of MAPS into Michigan health systems, physician groups and pharmacies that apply. Mark Cochran, who co-chaired the Medical Work Group as part of Monroe County’s Call to Action to Reduce Prescription Drug and Heroin Addiction, supported the bill. April Demers, chief operating officer of the Lenawee Community Mental Health Authority, thanked Zorn for his efforts. Zorn’s bill is part of a multi-bill package to help curtail the rising opioid abuse epidemic. LANSING, Mich. — Sen. Dale Zorn’s legislation to eliminate the sales and use taxes on dental bridges, crowns, dentures and other prosthetics is on its way to the governor’s desk to be signed. “Frustration with the ever-increasing cost of health care is one of the most common things I hear about when meeting people throughout Monroe and Lenawee counties,” said Zorn, R-Ida. “As we do what we can to make health care and dental care as affordable as possible for Michigan families, it doesn’t make any sense to start taxing dental products that greatly improve the health of hundreds of people every year. 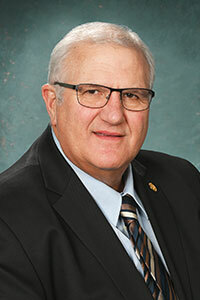 LANSING, Mich. — The Michigan Senate on Wednesday approved Sen. Dale Zorn’s legislation that would require drivers to slow down and move over when approaching a vehicle with amber flashing lights, such as a utility vehicle or tow truck. 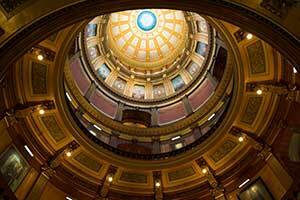 “The goal of this reform is to increase safety and save lives,” said Zorn, R-Ida. “Stopping on the side of a road or highway and getting out of a vehicle is dangerous and can be deadly. That is why Michigan already requires drivers to take safety precautions in construction areas and when passing a stopped police car or ambulance with their lights on. Drivers in Michigan are currently required to move over a lane to the left if there is a stationary authorized emergency vehicle with flashing red, blue or white lights on the side of the road. If the road does not have a passing lane, or if moving over is impossible, then a driver shall pass with due care and caution at a reduced and safe speed. Violators can face up to 90 days in jail, a fine of up to $500 or both. Senate Bill 477 would add vehicles with flashing amber lights to the current law and require drivers to slow down by a least 10 miles per hour when approaching and passing a stopped emergency vehicle. Zorn said that in January a tow truck driver on I-94 near Ypsilanti was hit by a van while assisting a disabled vehicle. The tow truck was parked on the shoulder with its amber emergency lights on. SB 477 has been sent to the House of Representatives for consideration. LANSING, Mich. — The House Commerce and Trade Committee on Tuesday approved Sen. Dale Zorn’s legislation to help attract new business investment to the state’s border communities. As approved by the House committee, Senate Bill 40 would expand the “qualified new job” definition to include every job at a business project located in Michigan, as long as the business certified in writing at the time of disbursement that at least 50 percent of its employees are Michigan residents. SB 40 now heads to the full House of Representatives for consideration.